According to McDonald, lifestyle consists of seven dimensions: nutrition; tobacco, alcohol and drug use; physical activity; occupational factors; social relations; self-care; and stress.18 Some studies have explained the effect of factors such as nutrition and weight gain during pregnancy, inappropriate health behaviors (such as the use of tobacco and alcohol), ethnicity, age, and place of residence on the incidence of LBW from a biological perspective.9,19–22 However, no study has been performed on the correlation of mothers’ lifestyle with LBW from the perspective of social determinants of health in Iran. After a 10-year systematic review of articles on LBW published in Iran,23 the following theoretical assessment model [Figure 1] was proposed regarding the conceptual framework of determinants. Figure 1: The theoretical model of the correlation between mothers’ lifestyles during pregnancy and low birth weight. The present report is a part of the results of a broad study titled, “Development of Mother’s Lifestyle Scale during Pregnancy with an Approach to Social Determinants of Health and communicative model between Mother’s Lifestyle during Pregnancy with Low Birth Weight”. Two methods were used in this study: methodology for the purpose of designing the instrument, and case-control for determining and presenting the correlation model. Within four stages, the study was performed on 750 mothers of infants with birth weight lower than 4000 g using the multistage sampling method. The participants of this study were Iranian pregnant women who went to selected hospitals for delivery between May 2012 and March 2013. They were aged 15–45 years, and were at a gestational age of 37–42 weeks based on their first day of last menstruation (LMP) or ultrasound. The inclusion criteria of the study were as follows: being willing to participate in the study, having no medical conditions (such as multiple fetuses, cardiovascular diseases, diabetes, renal diseases, thyroid diseases, pulmonary diseases, autoimmune diseases, preeclampsia, placental abruption, premature rupture of membranes during or after delivery, hepatitis, AIDS, and TORCH syndrome), using no medications that could affect birth weight, and giving birth to a living and normal infant weighing less than 4000 g.
Tehran was divided into five regions (North, South, East, West, and Central), one hospital (affiliated with a university or the Social Security Organization) was selected randomly in each region. Then, a total of 750 participants were selected proportionate to the delivery statistics of each hospital. The researchers started the study upon receiving permission from the authorities of the university and selected hospitals, providing necessary explanations to the participants, and gaining their consent. The questionnaire was completed by a trained team. To do so, mothers with inclusion criteria in the delivery ward were identified and monitored up to delivery. The researcher or a questioner was present in the delivery room during delivery and recruited the mother if the infant did not have any medical problems and his/her weight was less than 4000 g according to the scale in the delivery room. Once the mother was transferred to the postpartum ward, informed consent was received from her if she was in a suitable condition and was willing to participate in the study. Then, questions related to laboratory results, ultrasound results, and the mother’s medical history were completed using her medical records. Questions on demographic specifications and lifestyle were completed via an interview with the mother. During the 11 months of sampling, all deliveries at the selected hospitals (851 in total) were examined. Some deliveries were excluded [Figure 2], and sampling was stopped when the sample size reached 750. In this study, the fit of the theoretical model determining the correlation of concurrent structural determinants and mothers’ lifestyles during pregnancy with LBW [Figure 1] was examined using path analysis. 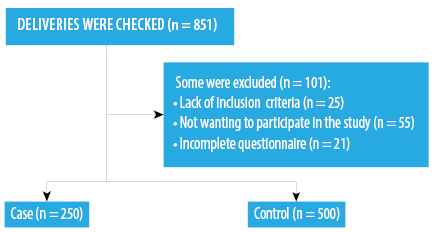 Figure 2: Number of participants and their designation into the two groups. Path analysis is a generalization of the conventional regression analysis, which shows the indirect effects beside the direct effects and the effect of each variable on dependent variables. The results of path analysis can be used to provide a reasonable interpretation of relationships and correlations observed between variables of the study. The data were analyzed in SPSS Statistics (SPSS Inc. Released 2007. SPSS for Windows, Version 16.0. Chicago, SPSS Inc.) and Lisrel software version 8.8 (Lincolnwood, IL: Scientific Software International, Inc.) using logistic regression, T-test, and path analysis. The two groups (the control group of 500 mothers with infants weighing 2500–4000 g, and the case group of 250 mothers with infants weighing less than 2500 g) were not significantly different in terms of the following variables: mean age, gestational age, birth spacing, age at marriage, history of having a LBW infant, miscarriage and stillbirth, mean weight before pregnancy, body mass index (BMI), hemoglobin (HB), and hematocrit (HCT). The groups were matched in terms of the above variables. However, the two groups were significantly different when considering the mother’s mean weight gain during pregnancy (p = 0.002), educational level (p = 0.030), family size (p = 0.002), number of pregnancies (p = 0.007), husband’s support during pregnancy (p < 0.001), and husband’s occupation (p < 0.001) [Table 1]. In this respect, the logistic regression was used to determine the correlation between dimensions of lifestyle and birth weight in the presence of the above variables. Based on the results, the most influential dimensions of lifestyle were the occupational lifestyle and social relations of mothers, as an increase in the score of a mother’s occupational lifestyle by one point resulted in an increase in the risk of LBW by 2.01 (p < 0.001). However, an increase in the score of a mother’s social relations by one point resulted in a decrease in risk of the LBW by -0.08 (p < 0.001) [Table 2]. Bivariate analyses were used to examine the correlation between variables for path analysis. According to the results, birth weight significantly and directly correlated with educational level, weight gain, nutrition, self-care, and mother’s social relations. There was a significant and indirect correlation with husband’s support, the level of activity at home, the total level of activity, occupational lifestyle, and mother’s stress level (p < 0.050) [Table 3]. The path analysis examined the effect of sociodemographic variables (structural determinants) and lifestyle dimensions (an intermediate determinant) on the birth weight [Figure 3]. 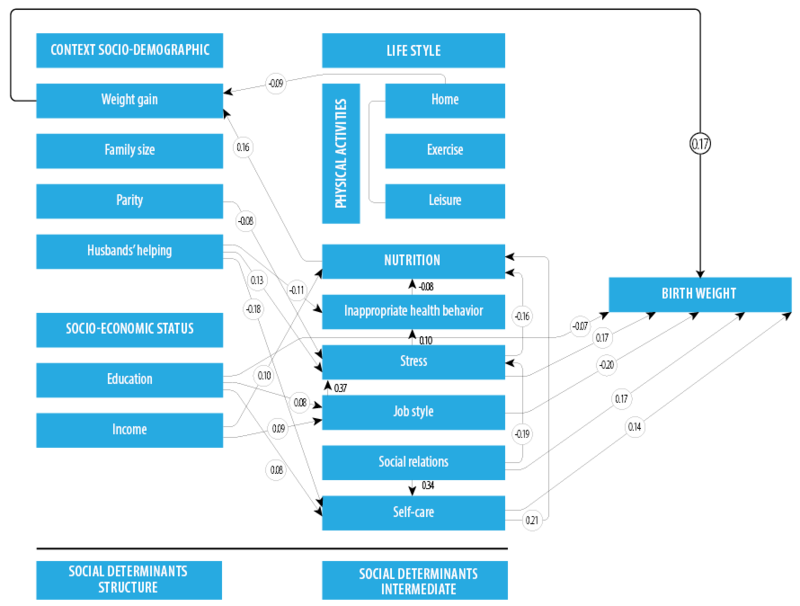 Figure 3: The estimated (standardized) coefficients related to the correlation between dimensions of lifestyle and sociodemographic factors based on the proposed model. (β = -0.002), and self-care (β = -0.015) were influential in birth weight indirectly from one path. In the proposed model, 42% of the variance of LBW was justified by the variables affecting birth weight [Table 4]. The fitted model did not differ from the conceptual model significantly, and fit indexes of the model showed the desirability, high fit of the model, and reasonable relationships of the variables adjusted on the basis of the conceptual model [Table 5]. Table 1: Comparing some individual social characteristics of research units in the two groups of normal weight and low weight infants (2012–2013). BMI: body mass index; HB: hemoglobin; HCT: hematocrit; NBW: normal birth weight (infants weighing 2500 g and more); LBW: low birth weight (infants weighing less than 2500 g). *Statistically significant p < 0.050. Results are given as mean±SD or n (%). Table 2: The correlation of birth weight with mothers’ sociodemographic characteristics in mothers. h/w: hours per week; B: regression coefficient; SE: standard error; CI: confidence interval; R: reference. Table 3: Correlations among dimensions of lifestyle and sociodemographic factors. Correlation is significant at the 0.050 level. Table 4: Path coefficients for lifestyle dimensions and sociodemographic factors on birth weight. Table 5: Goodness of fit indices, n = 750. RMSEA: root mean square error of approximation; GFI: goodness of fit index; NFI: normed fit index; CFI: comparative fit index; IFI: incremental fit index; df: degrees of freedom; X2: chi-square. Among the structural determinants of birth weight, the underlying factor of mothers’ weight gain and the socioeconomic factor of mothers’ education influenced birth weight the most. Inappropriate weight gain during pregnancy reflects the deficiency of nutrients essential for the fetus. Mothers are the only source of nutrition for a fetus, and if mothers do not have favorable nutrition for any reason, their fetus does not receive essential nutrients for their growth. Regardless of genetic factors, mothers’ weight gain during pregnancy leads to an increase in infants’ birth weight, that is, there is a direct correlation between mothers’ weight gain during pregnancy and birth weight.33 This variable is under the influence of different factors, including poor socioeconomic conditions of mothers.34 Adlshoar et al,10 found that mothers in low-income families did not have good nutrition because they could not buy the necessary foods, and this situation interfered with mothers’ weight gain during pregnancy and resulted in more LBW infants. The educational level is considered the most fundamental socioeconomic factor because it affects future occupational opportunities and income. This variable can prevent the adverse outcomes of pregnancy through educational experiences and skills, such as improving the home environment, nutrition, self-care, and cognitive stimulation. Thus, it is considered a very important determinant of birth outcomes.35 The immediate results conformed to that of many studies. Kehinde et al,36 found that mothers’ educational level was more influential in LBW than fathers’ educational level. One of the strengths of this study was matching the study groups for confounding factors, including gestational age, mothers’ age, birth spacing, age at marriage, history of having a LBW infant, miscarriage and stillbirth, mean weight before pregnancy, BMI, HB, and HCT. Mothers, especially those with natural delivery, are admitted to hospitals for a short time, and this resulted in the collection of data in a short time after delivery in the postpartum ward. Therefore, mothers’ fatigue and forgetting some things over time might have affected their answers and was a limitation of this study. The review of lifestyle dimensions showed that all of the dimensions directly, indirectly, or both affected birth weight. Thus, given the importance and the role of lifestyle as an important determinant affecting birth weight, attention, and training interventions are important to promote healthy lifestyles in pregnant women. The present study was approved by the Ethics Committee of the University of Social Welfare and Rehabilitation on December 4, 2011. We would like to thank the research deputy of the university, the head of the research center for social determinants of health, and all the participants for their cooperation. Marcdante K, Kliegman R. Nelson essentials of pediatrics. 4 ed. Philaelphia: Saunders; 2002. 2. World Health Organization. Guidelines on optimal feeding of low birth-weight infants in low-and middle-income countries: World Health Organization; 2011. 3. Behrman RE, Kliegman RM, Jenson HB, Nelson WE. Nelson textbook of pediatrics. Philadelphia: W. B. Saunders Company; 2004. 4. Chun HM. The effect of parental occupation on low birth weight. Hong Kong: University of Hong Kong; 2004. 5. Eghbalian F. Low birth weight causes survey in neonates. Iranian Journal of Pediatrics 2007; 17(Suppl 1):27-33. 6. Guyer B, Ma S, Grason H, Frick KD, Perry DF, Sharkey A, et al. Early childhood health promotion and its life course health consequences. Academic Pediatrics 2009;9(3):142-149.e1-71. 7. Health policy council Sotsdoh. Early child development. Tehran: Ministry of Health and Medical Education; 2011. 8. Golestan M, Fallah R, Karbasi SA. Neonatal mortality of low birth weight infants in Yazd, Iran. Iran J Reprod Med 2008;6(4):205-208. 9. Alexander GR, Wingate MS, Mor J, Boulet S. Birth outcomes of Asian-Indian-Americans. Int J Gynaecol Obstet 2007 Jun;97(3):215-220. 10. Adlshoar M, Pakseresht S, Baghaee M, Kazemnezhad A. Survey predictive factors of neonatal low birth weight in mothers referring to hospitals in Rasht. Iranian Journal of Gilan University of Medical Sciences 2006;15(54):33-38. 11. Cunningham F, Leveno K, Blomm S, Hauth J, Rouse D, Spong C. Williams obstetrics. 23th ed. New York: McGraw-Hill Companies; 2010. p. 527. 12. Takito MY, Benício MH. Physical activity during pregnancy and fetal outcomes: a case-control study. Rev Saude Publica 2010 Feb;44(1):90-101. 13. Sajjadi H, Vameghi M, Madani S. Social equity and health of children in Iran. Soc Welfare Quarterly 2010;9(35):89-137. 14. Solar O, Irwin A. Towards a conceptual framework for action on the social determinants of health. Commission on social determinats of health. Geneva: World Health Organization; 2005. 15. Kamali FM, Alizadeh R, Sehati SF, Gojazadeh M. The effect of lifestyle on the rate of preterm birth. Iranian Journal of ardabil university of medical sciences. 2010;10(1):55-63. 16. Anderson K, Nisenblat V, Norman R. Lifestyle factors in people seeking infertility treatment - A review. Aust N Z J Obstet Gynaecol 2010 Feb;50(1):8-20. 17. Homan GF, Davies M, Norman R. The impact of lifestyle factors on reproductive performance in the general population and those undergoing infertility treatment: a review. Hum Reprod Update 2007 May-Jun;13(3):209-223. 18. Mcdonald S, Thompson C. Women’s health. Australia Elsevier. 2005:90-121. 19. Delaram M, Akbari N. Weight gain in pregnancy and its correlation with birth weight of infants. Knowledge and Health 2007; 3(2):39-43. 20. Mosayebi Z, Fakhraee H, Movahedian A. Prevalence and risk factors of low birth weight infants in Mahdieh Hospital, Tehran. Iranian Journal Faiz 2004;30:65-79. 21. Talebian MH, Afrouz GA. The relationship between biological, psychological-cognitive and social-cultural characteristics of parents with Infant’s birth weight in Isfahan province. Health System Research 2011;6(2). 22. Tootoonchi P. Low birth weight among newborn infants at Tehran hospitals. Iranian Journal of Pediatrics 2007;17(Suppl 2):186-192. 23. Mahmoodi.Z, Karimlou M, Sajjadi H, Dejman M, Vameghi M. Low birth weight and its associated factors in Iran: According to World Health Organization model. Journal of rehabilitation 2012;13(3):75-85. 24. Mahmoodi.Z, Karimlou M, Sajjadi H, Dejman M, Vameghi M. Designing measurement tools and correlation Model between Mothers lifestyle during pregnancy and Neonatal low birth weight. Social Determinant of Health Research Center, University of Social Welfare and Rehabilitation Sciences, Tehran, Iran 2012 [ PhD Thesis] . 25. Banerjee B. Physical hazards in employment and pregnancy outcome. Indian journal of community medicine 2009;34(2):89-93. 26. Niedhammer I, O’Mahony D, Daly S, Morrison JJ, Kelleher CC; Lifeways cross-generation cohort study steering group. Occupational predictors of pregnancy outcomes in Irish working women in the Lifeways cohort. BJOG 2009 Jun;116(7):943-952. 27. Palmer KT, Bonzini M, Harris EC, Linaker C, Bonde JP. Work activities and risk of prematurity, low birth weight and pre-eclampsia: an updated review with meta-analysis. Occup Environ Med 2013 Apr;70(4):213-222. 28. Plus R. Physical and shift work in pregnancy: Occupational aspects of management. A national guideline. Royal College of Physicians; 2009. 29. Benach J, Muntaner C, Santana V, Chairs F. Employment conditions and health inequalities. Final report to the WHO Commission on Social Determinants of Health (CSDH). Employment Conditions Knowledge Network (EMCONET) Geneva: WHO;2007. 30. Soogheh KF, Ghavi A, Niknami M, Leili EK. Relationship between mothers’ nutritional status and weight gain during pregnancy with low birth weight. Journal of Guilan University of Medical Sciences 2012;21(83):27-35. 31. Thoits PA. Mechanisms linking social ties and support to physical and mental health. J Health Soc Behav 2011 Jun;52(2):145-161. 32. Holt-Lunstad J, Smith TB, Layton JB. Social relationships and mortality risk: a meta-analytic review. PLoS Med 2010 Jul;7(7):e1000316. 33. Muthayya S. Maternal nutrition & low birth weight - what is really important? Indian J Med Res 2009 Nov;130(5):600-608. 34. Cita YP, Resmiati. The Relationship between demographic factors and low birth weight infants. Int J Res Nurs 2010;1(1):25-28. 35. Adler NE, Newman K. Socioeconomic disparities in health: pathways and policies. Health Aff (Millwood) 2002 Mar-Apr;21(2):60-76. 36. Kehinde OA, Njokanma OF, Olanrewaju DM. Parental socioeconomic status and birth weight distribution of Nigerian term newborn babies. Niger J Paediatr 2013;40(3):299-302.